The physics are completely off... If you did that, the cat would spin so fast it would create a black hole. It's common sense stuckpixel! @its super effective, I'm more concerned about where that metal rod is going into the cat. 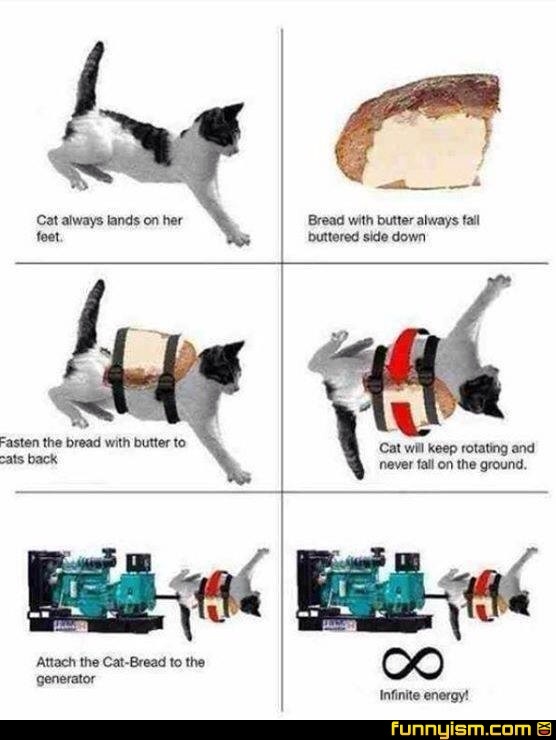 @its super effective, even by their own logic the bread has already landed on the cats back, buttered side up. Or it never fell in the first face so the cat would just be running around with toast on its back unless the toast landing was relevant to the ground which would leave a conflict between cat and toast as the force of butter tries to twist to the ground and the cat resists to stay in its position. @its super effective, false, black holes are cause by an immense amount of matter being crammed into a small amount of space. @B0b Saget, precisely. Like Puppy said. The bread would have already landed on its buttered side, causing the cat to be under immense pressure resulting in a black hole. @B0b Saget, By spinning infinitely fast, all matter outside the immediate centre is always in the same place. Guys I tried to do this and all I got was a very pissed off cat and many cuts. Finally, a real solution to world hunger! @HateMyDuck, we eat the energy? Okay, so I'm at the RIT open house and there's a little cartoon playing by a student. It's about vats landing on their feet and toast with jelly always landing jelly side down. If you put both together it would create infinite power. I can't be sure but maybe, just maybe, they knew I was there and are messing with my head. I dunno. Anyone else at that open house? You had me at cat and buttered bread. This is explained pretty well in a youtube video called buttered cat physics. I just dropped one of these babies into my Jaguar. Running at 5CP (that's 5 cat power) that thing runs like a scalded cat. Actually, the cat over-weighs the butter therefore the cat would still land on her feet. They say I'm fun at parties. How would they get the cat to stay attach........ nevermind. Why not attach cats back to back? You don't waste a good piece of buttered bread and you get a show! If you attached it to a generator, it would no longer be falling, and so would not spin. You need to find a different way to use the rotational energy. Why not magnets? Everything is better with magnets!